Already in Stone Age hunter-gatherer society the pursuit of luxury objects was great. Everything was not only about survival and adaptation to the environment and to a changing climate. This is evident in new research from an international research group with, among others, Stockholm University. This is incipient Jōmon pottery from Hanamiyama site, Yokohama-shi, Kanagawa Prefecture, Japan. Credit: Nara National Research Institute for Cultural Properties, Japan. – Pottery was introduced as a prestige technology. The pots were reserved for festivities and boastings of status-filled food such as fat and oil from salmon or marine mammals, he says. 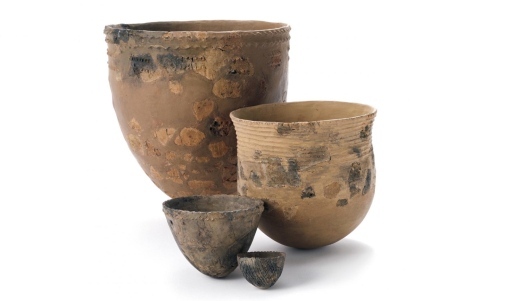 After the great climate change at the end of the Ice Age some 11 500 years ago, the ceramic technology spread and became more established; the vessels became more common and larger. But they were still exclusively used for the preparation of fish and marine mammals as well as for shellfish. They were not used for the processing of plant foods from the ever richer vegetation brought by the ameliorated climate. – This marks a significant change in the role of ceramics as a food preparation technique. But because ceramic vessels were prestigious items when the technology was introduced, a strong link, a cultural norm, arose between the cooking technique and the food. It was unquestionable that ceramic vessels should only be used for the preparation of fish and nothing else, says Sven Isaksson. The Jōmon pottery is one of the world's oldest ceramic styles, and has given its name to the Jōmon period (between c. 14,000 and c. 900 to 300 years BCE). Those who lived in the Japanese archipelago were fishers, hunters and gatherers. The earliest pottery was decorated by cords being pressed into the surface of the wet clay, which gave the name for the pottery style. (Jōmon is Japanese for cord-marked). About Early Pottery Research Group.